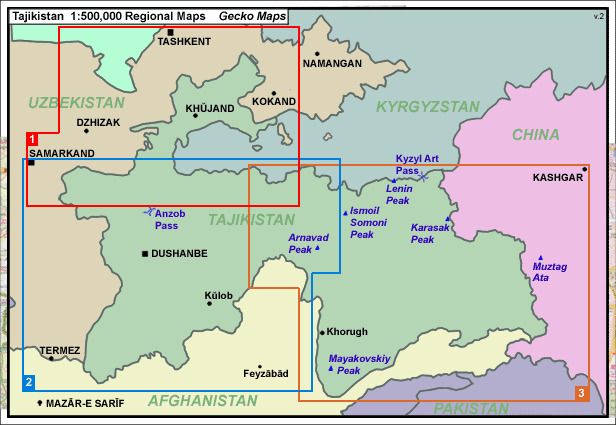 Northern Tajikistan in a series maps of Tajikistan and the adjoining areas of the neighbouring countries, providing coverage from Samarkand to Kashgar, including the Pamir Mountains. The maps have been produced under the auspices of the Swiss Agency for Development and Cooperation and each title includes information on the area’s culture, economy, history, etc. The maps have contours at 200m intervals, enhanced by relief shading, numerous spot heights, plus names of peaks and mountain passes. 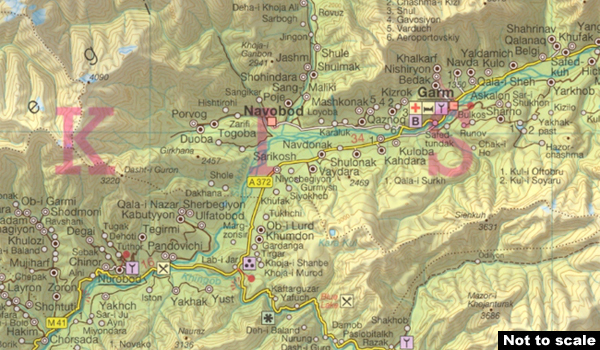 Road network includes dirt tracks and trekking routes are marked. Numerous population centres are finely graded according to the number of inhabitants. The maps also show local administrative boundaries. 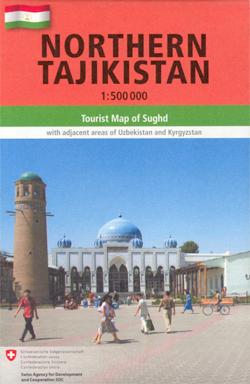 A wide range of symbols mark various places of interest and general facilities: cultural sites including museums, shrines, archaeological sites, etc; natural sites such as caves, interesting geological formations, waterfalls and springs; general facilities including accommodation, bazaars, fuel supplies, information centres, border crossings, etc. The maps have a latitude and longitude grid as indicated in the individual descriptions. On the reverse each map has a description of the area, its history, culture, economy, ecology, etc. and includes a street plan of the main town. Map legend and all the text are in English. *In this title:* latitude grid lines at 20’ intervals, with longitude at 30’. On the reverse is a street plan of Khujand indicating various places of interest and facilities.